I’d like to personally invite you to a class that I’m teaching on Wednesday, October 26th from 9:30 a.m. to 4:30 p.m. We will go over market shifts and how to ensure that your business thrives during one. Because we’re definitely seeing indicators in the real estate market which signal that the market is shifting, we’ll be discussing Gary Keller’s best-selling book Shift. This book is about how great agents handle rough times in the real estate market and also goes into detail about how to maintain and gain market share as the market shifts. 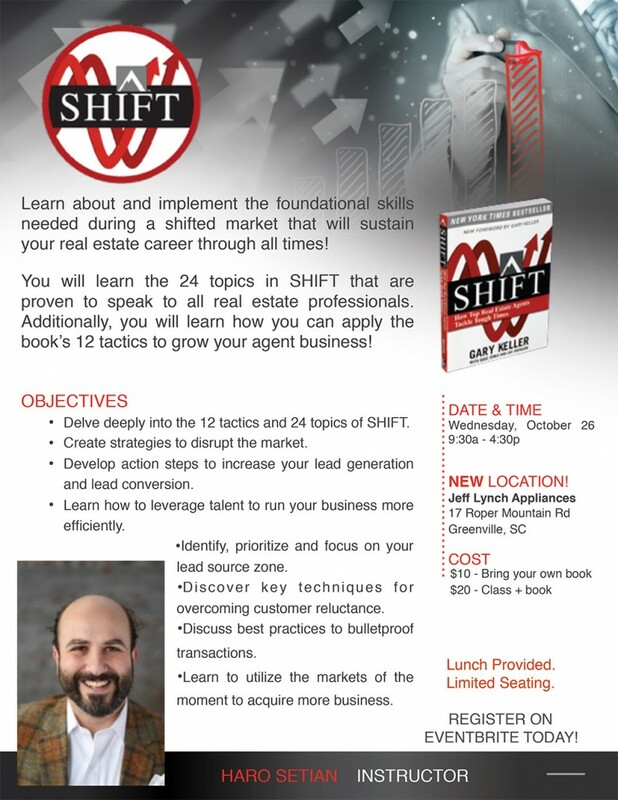 The class will take place at Jeff Lynch Appliances at 17 Roper Mountain Road right here in Greenville, and it’s open to anybody in real estate or other businesses. Lunch will be provided, and since we already have over 20 people from different brokerages signed up, be sure to RSVP here. I hope to see you there! What’s Happening in Our Real Estate Market? Ready to Grow Your Career? We’re Hiring! How Will Our Changing Market Impact Your Real Estate Goals?